The frontispiece alone makes it worthwhile. The caption reads: "Mr. Drew reached out to rescue Nancy" and the picture shows Nancy dangling out of a tower window above a falling ladder and Carson heroically catching her. It you look closely at the illustration, it actually looks like Carson Drew has an Amazing Magnet Hand, because his hand isn't gripping Nancy's shoulder at all -- it's just resting on top of it. Actually, for Carson's Amazing Magnet Hand to work, our girl would have to have an Amazing Bionic Shoulder. I'm okay with believing that, as there weren't any new skills listed. Basic plot, from page one: "The three friends were headed for a secluded inn called The Sign of the Twisted Candles. The Marvin family and the Faynes were related to a very old man who lived there. Rumors had recently come from neighbors of theirs who had overheard a conversation at the inn that he was virtually a prisoner in the tower of the old-fashioned mansion." So the Fayne and Marvin adults don't bother to check out the rumors. No, the girls go. The adults in this series -- discounting Carson, of course -- are the most unmotivated people EVER. Yet again, a crime is committed in Hannah Gruen's presence and her solution is to call Nancy (who is out of town) rather than bother calling the (admittedly useless) police. Also, the same security guard gets knocked out at least twice. The story begins with the girls (big shock coming up) driving through the obligatory terrible storm. They (again, big shock) have to get out and walk when a tree falls across the road. Later, the storm also causes the obligatory disconnected phone call scene. More ways to spot villains: thin lips, heavy-set, balding, purring voice. When she remained silent, Nancy said, "I'm Nancy Drew. These are my friends Bess Marvin and George Fayne." On purpose she slurred the last names so the girl would not repeat them. Asa Sidney gave a mirthless laugh. "The only reason I have lived to be a hundred is because I have not died!" Nancy shuddered a little. Plainly Mr. Sidney was far from happy. The man looked about him, studied the windows of the house carefully, and then began to dig quickly. "He's going to bury something!" Nancy speculated. I have to admit, though, the next bit made me want to cheer -- after seeing Mr. Jemitt bury the chest, Nancy sneaks outside, digs the chest up, drags it to her car, brings it to the bank (surviving the obligatory car chase on the way) and deposits it into the vault. Because, you know. You gotta keep yer clues safe. As gorgeous and unforgettable as Nancy Drew is supposed to be, she sure has a lot of doubles -- when she walks into the tower room, the 100-year-old prisoner thinks she's his dead wife. A restaurant that has bells on the tables to signal waitstaff? Is that a Before My Time thing, or am I going to the wrong restaurants? I never thought I'd see the day where the chums split up. Page 22 is the first time Bess and George learn of the feud between Asa Sidney and their families. By page 71, they both hate Nancy because they're convinced that she and her father are trying to bilk them out of an inheritance. All drained their glasses of fruit punch, Bess looking wistfully at the maraschino cherry which obstinately remained in the bottom of her glass. Nancy was in a quandary. She knew her father would never touch the woman. If Mrs. Jemitt was to be forcibly removed from the stairway, she would have to do it! With the speed of a panther Nancy grabbed Mrs. Jemitt's arms and swung her around out of the way. Later, Mrs. Jemitt retaliates by attempting to beat Nancy with a hairbrush! Good times. "I love old Mr. Sidney. He's so friendless and pathetic." I'm running out of time here, but seriously. This one is AWESOME. Thanks-- I love your ND reviews! I loved your review of this ND book. Someday I plan to re-read them all...in order. My friend gave my daughter a set of the first four or five books as a gift. She has absolutely NO INTEREST. (What is wrong with her anyway?) I plan on staking my claim! Thank goodness! About time we had another Nancy Drew review. From the "who wrote ND" files: Walter Karig wrote the manuscript based upon an outline by Harriet S. Adams. Harriet significantly rewrote this one after Walter turned in the manuscript. Next volume was also done by Walter and Harriet. "All drained their glasses of fruit punch, Bess looking wistfully at the maraschino cherry which obstinately remained in the bottom of her glass." OK - I dare anyone to find another mention in literature of a character looking wistfully at a maraschino cherry. I nearly spit my coffee on the monitor. Woohoo. Next one quicker please. Guess who got to finally finish HP this weekend? Also, I got the best excuse ever. Girl doesn't show up for the last three days of class (wed, thurs, fri), the big prose exam is on Monday. We hear nothing from her. Keep in mind we cover about a week's worth of material (in a college level course) every day. She shows up today and claims with a totally straight face that she slept from Tuesday afternoon to Monday morning. I am going to have to read this, if only to find out more about the Cinnamon Toast Incident. I laughed all the way through this, starting with Carson Drew's Amazing Magnet Hand. Do the thin lips, heavy-setness and baldness all belong to the same person? Because it would be so hard, and yet awesme, to reconcile that with a purring voice. These reviews are quite possibly the most awesome things ever. I wish I had noticed Carson's Amazing Magnet Hand when I read this one! Hee. 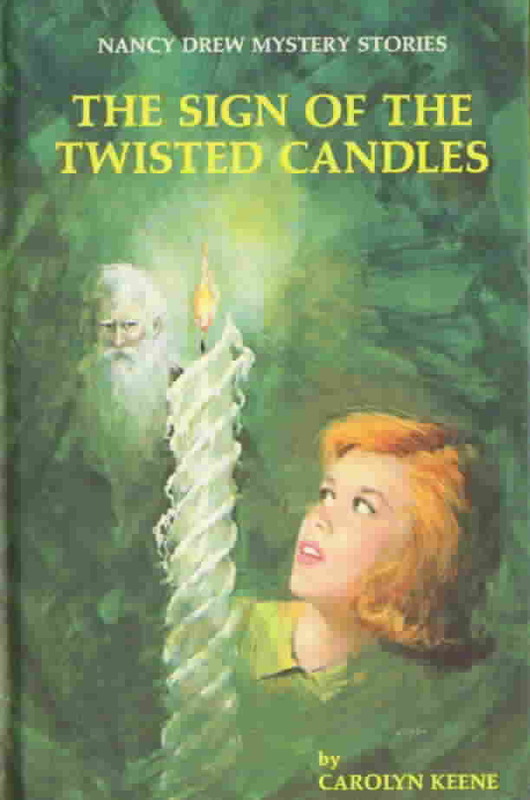 Oh holy cow; you're a wonderful writer, and this "Twisted Candles" synopsis is fantastic! oH! !hOW i Love the Twisted Candles! I recently finished the novel in a couple of hours.My favorite character is Nancy Drew.She is very brave!. Awesome novel! !So cool..This is definitely a great Nancy Drew mystery.this novel is very descriptive and you can just be there with Nancy. I was right there the whole time. !